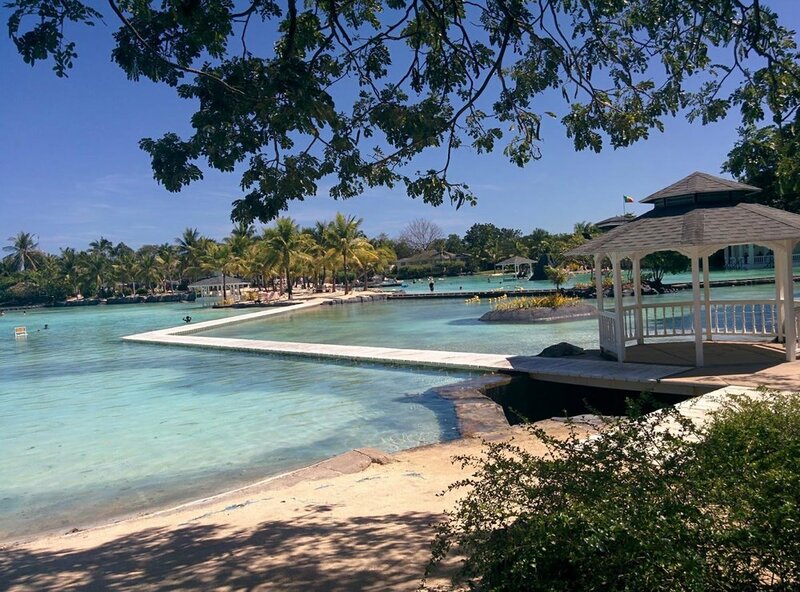 The last time I visited Mactan, I stayed in a five-star resort with a man-made lagoon in the middle of clusters of handsome Colonial-style buildings. It felt like a picture-perfect village with well-appointed rooms, pools, tennis courts and wonderful restaurants. The spa offered a variety of massages and had wonderful hot and cold pools with cascading falls. The beach had fine white sand (bought by the ton and dumped there to cover the rocky shore). 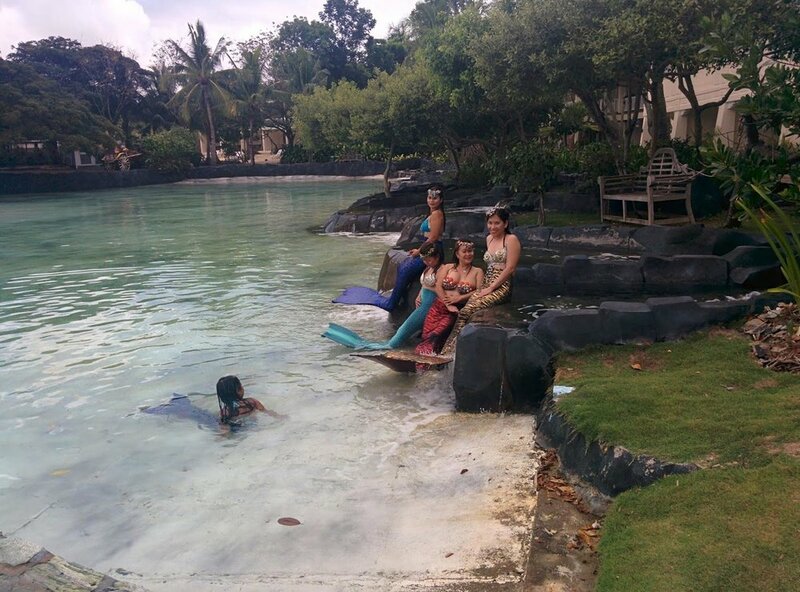 There were horse-drawn carriages, a fortune teller you could consult for fun, and I even saw mermaids in the lagoon – fake but fanciful creatures that rounded out the sense of being in a fantasy world. There are many seaside resorts such as this one in Mactan, and I had to reflect on how different Mactan is now, compared with what it had been when I was growing up. When I was a child and living in Cebu, the Island of Mactan was a dry, unremarkable place that we visited only once in a while. Despite being only 8 miles away from Cebu, Mactan seemed cut off by a deep channel. Before bridges were built, we had to take a ferry to get across, and it was a major expedition to picnic there on beaches that had jellyfish and spiny sea urchins. We children preferred the Cebu beaches in Talisay or Liloan where we would swim, go clamming and eat lechon, atsara, puso (rice in woven packets), and my favorite consilva or caramelized sliced plantains. The beaches of Mactan did not offer such a variety of local delicacies. My mother, however, who was a devotee to the Virgen de la Regla of Opon (formerly Lapu-Lapu) liked to visit Mactan with me in tow because she had been at the fiesta of the Virgin when her birth pains began and she had to rush back to Cebu to give birth to me. My mother enjoyed telling me how the Virgen de la Regla had cured my grand-aunt from a serious medical problem, and in gratitude for this miracle, my great-grandmother, Remedios Cuenco, donated a pair of diamond earrings to the Virgin. The earrings, my mother said, would sometimes adorn Our Lady during her November fiesta. The jewelry was a connection between “her” and “us” and I felt, even at a young age, that I could count on the Virgen de la Regla for help if I needed it. Sometime in the 1950s, the airport in Lahug Cebu was transferred to Mactan, and because I attended schools in Manila, Mactan became a regular terminal stop when I traveled to and from Manila on school breaks. The time when Mactan grabbed my imagination was in the late 1960s when the Americans built an air base there. The Vietnam War was at its height from 1965 to 1968, and Mactan’s American Base housed the 772nd and 774th Troup Carrier Squadrons and other servicemen on R&R there. I recall being surprised to fly home one vacation time and finding young American men walking the streets of both Mactan and Cebu. Suddenly both places were rocking with honky-tonk bars and accompanying colorful girls. I was a teenager then and my girlfriends and I noticed that some of these young American men were “cute” – tall, young, good-looking, but although no one actually spelled it out to us, we knew that “good” girls did not date American soldiers. Even though we were born after World War II, we had heard stories of young women during that war ending up with GI babies, na-disgracia -- disgraced. Despite this strict rule of conduct, some young women we knew would occasionally date American soldiers and we would run into these young men in parties. Those of us in the “good-girl” category were always mildly scandalized that these “loose” girls ran around with these soldiers. But frankly, even those of us in the “good-girl” group were not entirely innocent. Once, three of us girls picked up an American soldier in Cebu, and we drove to Mactan and dropped him off near the American Base. One of the girls was flirting with him, but I was too shocked by the “wrongness” of what we were doing that I zoned out and missed out on what went on. But sexual mores aside, I did watch TV news and read newspapers and magazines, and as early as 1963, had tucked away in my mind images of Vietnamese Buddhist monks who had set themselves on fire to protest the South Vietnam regime. I was starting to puzzle over how America, a democratic country, could prop up the likes of Vietnamese President Ngo Dinh Diem. And likewise, in the Philippines, I was beginning to scrutinize American support for President Ferdinand Marcos, who by that time was starting to exhibit an authoritarian streak. By 1967, when these American soldiers were in Mactan and Cebu, I had an understanding that the US was interfering in Vietnam. I had feelings of love-hate towards the American servicemen who in my eyes represented America. Love, because America was still what I read about and saw in movies – wealthy and beautiful, and yes idealistic, at least in the Democracy it spoke about. Hate, because America’s “slip was showing,” meaning, I was starting to see the dark side of America, the side that was willing to sacrifice non-Americans to get what it wanted. The American servicemen overran Mactan and Cebu for a few years. Before the Vietnam War ended in April 1975, the huge number of Americans in Mactan and Cebu petered out. Eventually, the Mactan Air Base was turned over to the Philippine Air Force. The honky-tonk bars and colorful girls vanished along with the young men who had walked the streets – my streets -- of Mactan and Cebu. Now, 50 years later, the memory of the American Air Base and the Americans in Mactan has grown dim and distant, like ghosts, almost forgotten. Cecilia Manguerra Brainard is the author and editor of 20 books including her recent novel, The Newspaper Widow (University of Santo Tomas Publishing House, 2017). Her official website is http://www.ceciliabrainard.com.